(Washington, D.C.)—Two years ago on July 14, six world powers and Iran finalized an historic nuclear agreement with Tehran that removed the threat of an Iranian nuclear weapon. The nuclear deal, known as the Joint Comprehensive Plan of Action, has proven to be a nonproliferation success. The agreement has significantly restricted Iran’s nuclear activities and imposed an intrusive monitoring and verification regime. The threat of a nuclear-armed Iran no longer looms over the international community. Despite the success of the deal, some policymakers in Washington are recklessly urging the Trump administration to abandon the agreement on the basis of inaccurate claims that Tehran is violating the accord. Six reports from the International Atomic Energy Agency demonstrate that Iran is meeting its commitments and the Trump administration certified in April that Iran is living up to its end of the deal. Before taking unilateral steps that risk the success of the agreement, Washington should carefully consider the consequences. Abandoning an agreement that is verifiably blocking Iran’s pathways to nuclear weapons is irresponsible and dangerous. It would further destabilize the region, and could open the door to a nuclear-armed Iran or increase the prospect of a costly war in the Middle East. Additionally, pulling out of a multilateral agreement that benefits international security sends the message to U.S. allies and partners that Washington cannot be trusted to follow through on its commitments. Given the current instability in the Middle East, it is now more vital than ever that Washington continue to support the nuclear deal with Iran and look for options to build on the agreement. Full implementation of the accord benefits U.S. national security and international efforts to prevent the spread of nuclear weapons. The new Treaty on the Prohibition of Nuclear Weapons marks a new phase in the seven-decade-long effort to prevent nuclear war. For the first time since the invention of the Bomb, nuclear weapons development, production, possession, use, threat of use, and“stationing” of another country’s nuclear weapons on a states party's national territory are all expressly prohibited in a global treaty. The treaty also requires states to provide assistance to those affected by nuclear weapons use and testing. While the treaty itself will not immediately eliminate any nuclear weapons, the treaty can, over time, further delegitimize nuclear weapons and strengthen the legal and political norm against their use. Steps aimed at reducing the risk of catastrophic nuclear weapons use are necessary and should be welcomed. The new Treaty on the Prohibition of Nuclear Weapons aims to reinforce the key disarmament component (Article VI) of the 1968 Nuclear Non-Proliferation Treaty (NPT), which requires its 190+ states parties to “pursue negotiations in good faith on effective measures relating to cessation of the nuclear arms race at an early date and to nuclear disarmament. Under the new treaty, states may not“test” nuclear weapons or any other nuclear explosive devices. This simply reinforces the 1996 Comprehensive Nuclear Test Ban Treaty (CTBT) which prohibits“any nuclear weapon test explosion or any other nuclear explosion” and has been signed by 183 states, including the United States, Russia, the United Kingdom, France, and China. The new treaty, which was negotiated by a group of some 130 non-nuclear weapon states, is an expression of the deep concern about the enormous risks posed by nuclear weapons and the growing frustration with the failure of the nuclear-armed states to fulfill their nuclear disarmament commitments. The initiative underscores the need for thenuclear weapons states’ to meet their existing legal obligations to end the nuclear arms race and pursue disarmament and the catastrophic humanitarian consequences of nuclear weapons. In our view, and in the view of many delegations, the final text of the Nuclear Weapons Prohibition Treaty should have been stronger. Key areas, particularly Article 3, which outlines the requirements for safeguards against nuclear weapons programs, could have been strengthened and improved. While the new treaty usefully outlines key objectives for verifying disarmament by nuclear-armed states in the future, the new treaty only obligatesstates parties not possessing nuclear weapons to maintain or bring into force a Comprehensive Safeguards Agreement with the IAEA“at a minimum." Unfortunately, the new Treaty on the Prohibition of Nuclear Weapons makes no specific reference to the value of more rigorous inspection procedures, known as the Additional Protocol or “AP+” measures, which is a goalthat states parties at this conference have already agreed to pursue in the context of the NPT. The 2000, 2010, and 2015 NPT Review Conference reports all stressed “that comprehensive safeguards and additional protocols should be universally applied once the complete elimination of nuclear weapons has been achieved.”The history of the Iraqi, North Korean, and Iranian nuclear programs shows that the IAEA safeguards regime must and has and will continue to evolve in order to effectively guard against clandestine nuclear weapons programs. 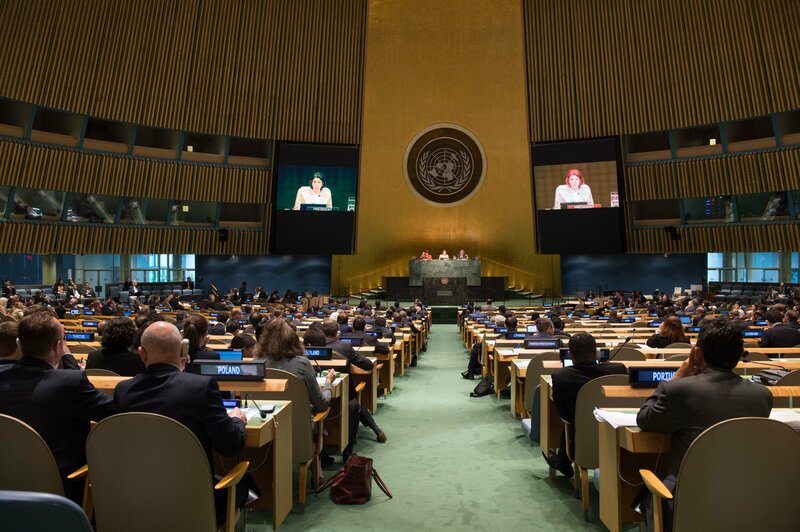 The new Treaty on the Prohibition of Nuclear Weapons is a historic step forward but, clearly, it is not an all-in-one solution to the dangers posed by nuclear weapons. Additional and difficult work lies ahead. Prohibition treaty supporters, skeptics, and opponents must put aside their disagreements about the new agreement and find new and creative ways to come together to strengthen the nuclear disarmament and nonproliferation regime. They must focus on advancing new and effective disarmament measures, while pursuing policies that ease the growing tensions between nuclear-armed states and increase the danger of nuclear weapons use. engaging in pragmatic and sustained diplomacy with North Korea, coupled with smart sanctions, to halt and reverse that country’sdangerous nuclear pursuits. 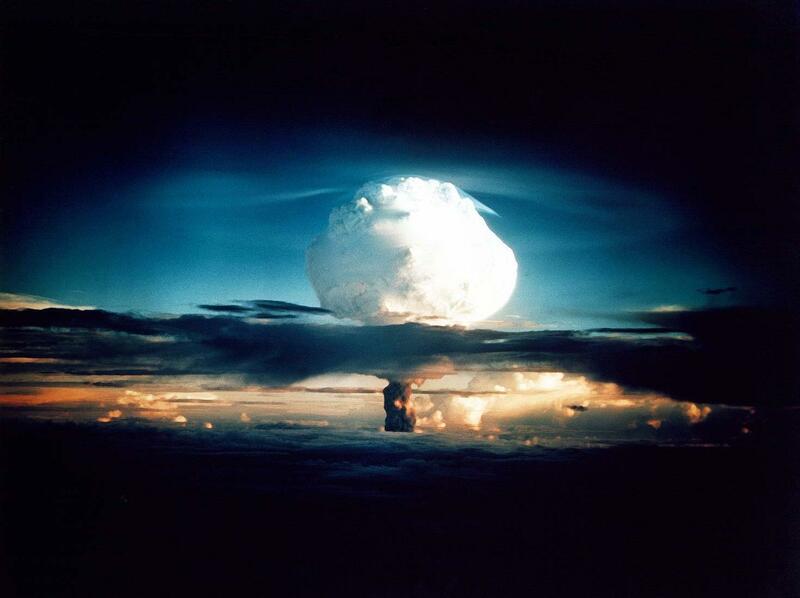 Nuclear weapons pose a global threat that demands global cooperation. Now is the time for stronger and smarter leadership from Washington, Moscow, and Beijing, as well as more active support from the world’s non-nuclear weapon states. (Washington, D.C.)—Congressional votes to block major arms deals are very rare, but today a substantial, bipartisan group of 47 Senators voted to support S.J. Resolution 42, a resolution of disapproval to transfer U.S. precision-guided munitions to Saudi Arabia, which is waging a controversial military campaign in Yemen. The close vote was a rebuke of Trump’s Middle East policy. In the final tally, 47 Senators voted for full consideration of the resolution, while 53 rejected that step. The growing opposition to the roughly $500 million sale indicates that President Trump will face tough resistance should he try to move forward with other elements of the still mostly undefined $110 billion arms package he announced last month to Saudi Arabia. “The Senate’s bipartisan stand today against the sale of precision guided munitions to Saudi Arabia puts the Trump administration on notice that their approach is off target,” said Jeff Abramson, nonresident senior fellow at the Arms Control Association. “The United States should not be sending more weapons into an unwinnable conflict and into the hands of a country that uses U.S. weapons against civilian targets. Instead, the Trump administration should use its influence to find a political solution to the disastrous war in Yemen, which has led to a massive humanitarian crisis,” Abramson added. “Current U.S. conventional arms transfer policy includes the goal of ‘Ensuring that arms transfers do not contribute to human rights violations or violations of international humanitarian law.’” Abramson noted. “Arms Sales to Saudi Arabia and Bahrain Should Be Rejected,” Arms Control Association Issue Brief, Volume 9, Issue 3, May 2017. “Defiant Congress Sparks Showdown With Trump Over Saudi Arms Deal,” Arms Control Today, June 2017. Media Contacts: Daryl G. Kimball, executive director, (202) 463-8270 ext. 107; Kingston Reif, director for disarmament policy, (202) 463-8270 ext. 104. (Washington, D.C.)—Today at the United Nations in New York, multilateral negotiations on a new “legally-binding instrument to prohibit nuclear weapons, leading toward their total elimination” will commence. The talks, which may conclude by the end of the year, are not an all-in-one solution to address today’s growing array of nuclear weapons-related dangers. But a new nuclear weapons prohibition treaty could be a useful and timely contribution to the seven-decade long struggle to reduce the threats posed by the Bomb. Contrary to some skeptics’ beliefs, this process is not a distraction from other disarmament work, nor will it undermine the NPT. In fact, the strong support for negotiations on a ban treaty is a logical and constructive international response to the failure of key nuclear-armed states to fulfill key commitments made at the 2010 NPT Review Conference to further reduce the role and number of nuclear weapons. Rather than get in the way of progress by lobbying against the negotiations, we call on U.S. President Trump and his administration to respect efforts by the world’s non-nuclear weapons majority to prohibit nuclear weapons and to reaffirm the United States' commitment to meet its NPT obligations and to continue to pursue the peace and security of a world without nuclear weapons. Specify which activities related to nuclear weapons possession, nuclear sharing planning, development, production, and testing are prohibited. Be consistent with existing treaties that prohibit or limit certain nuclear weapons-related activities, including the NPT. Provide for pathways by which states that now possess nuclear weapons, or are part of alliances with nuclear-armed states, can support the new nuclear weapons prohibition treaty before they become a full-fledged member of new instrument. The negotiators should seek a formula that is meaningful but also draws the widest possible support from states participating in the negotiation. Achieving and maintaining a world without nuclear weapons requires bold and sustained action. The coming ban treaty negotiations are not an all-in-one solution, but do represent an important and new contribution. 2) Preparations Made for Ban Talks, by Alicia Sanders-Zakre, Arms Control Today, March 2017. Mr. Trump’s comments suggest, once again, that he is ill-informed about nuclear weapons and has a poor understanding of the unique dangers of nuclear weapons. The history of the Cold War shows us that no one comes out on “top of the pack” of an arms race and nuclear brinksmanship. President Trump needs to work with Russia's President Putin to build down, not build up their excessive nuclear arsenals and stop stirring up nuclear tensions. In reality, New START has advanced U.S. and global interests by lowering and capping the two nation’s excessive strategic deployed nuclear arsenals, both of which remained poised on "launch-under-attack" alert status, meaning that thousands of nuclear weapons could be launched by the U.S. and Russian leaders within minutes of a presidential order. Discarding New START would irresponsibly free Russia of any limits on its strategic nuclear arsenal and would terminate the inspections that provide the United States with significant additional transparency about Russian strategic nuclear forces. A wide-range of U.S. national security leaders from, including Mr. Trump’s own Secretary of State Rex Tillerson, support New START. 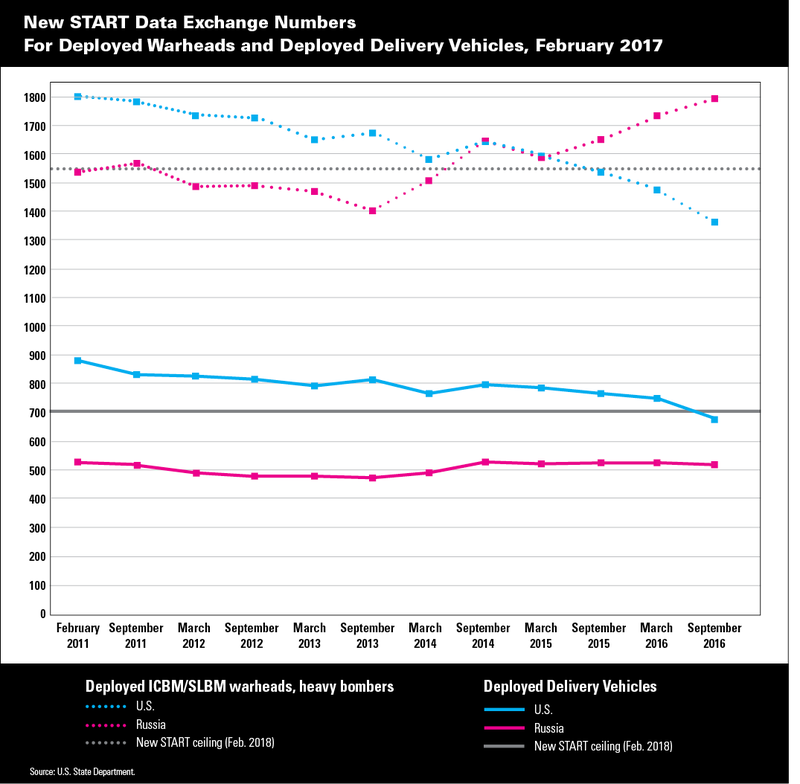 Currently, Russia deploys 1,796 strategic warheads, the United States 1,367, but the United States deploys 681 strategic delivery vehicles (ICBMs, SLBMs, and strategic bombers) to Russia’s 508, giving the United States a substantially greater warhead upload potential. Both countries will be required to meet the New START limits by February 2018. The agreement expires in 2021 but the two leaders could extend the treaty for another five years and take parallel, reciprocal steps to achieve further nuclear reductions. In 2013, President Barack Obama, with input from the Joint Chiefs of Staff and other elements of the national security establishment, determined that the United States can reduce its nuclear force by another one-third below New START levels and still meet U.S. deterrence requirements. Further nuclear reductions would reduce the price—estimated at $400 billion over 10 years by the Congressional Budget Office—to replace the U.S. arsenal at current levels. Expanding the U.S. arsenal with new or additional nuclear weapons would cost billions more. The five most recent U.S. presidents, including Barack Obama, George W. Bush, Bill Clinton, George H.W. Bush, and Ronald Reagan, all negotiated agreements with Russia to reduce their nuclear stockpiles. Mr. Trump must get smart and avoid reckless statements or actions that upend decades of successful efforts to reduce bloated nuclear arsenals and renew dangerous U.S. and Russian nuclear competition. (Washington, DC)—The New York Times report based on U.S. government sources that Russia has allegedly deployed an operational unit of ground launched cruise missiles (GLCMs) that violate the 1987 Intermediate-Range Nuclear Forces (INF) Treaty is extremely troubling and requires the immediate attention of senior policymakers in Moscow and Washington. According to the report, Russia has not only tested noncompliant systems but has apparently deployed INF Treaty noncompliant missiles, a breach of a key cornerstone of the U.S.-Russia nuclear arms control architecture that helped to halt and reverse the Cold War-era nuclear arms race and remove a significant threat to Europe. 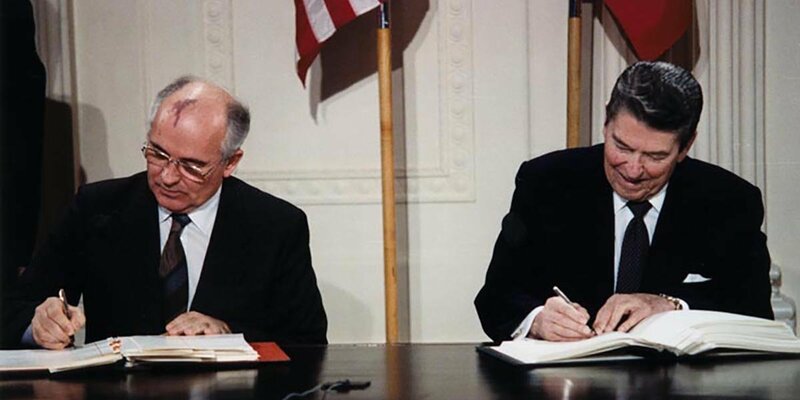 The INF Treaty required the United States and the then-Soviet Union to eliminate and permanently forswear all their nuclear and conventional ground-launched ballistic and cruise missiles with ranges of 500 to 5,500 kilometers. We call on Russia to immediately decommission the noncompliant missiles systems and return to compliance with the INF Treaty. We also urge President Donald Trump and administration officials to reiterate U.S. support for the agreement and convene another meeting of the treaty's Special Verification Commission (SVC) to address and resolve the compliance issues. The SVC was convened in November 2016 at the request of the United States for the purpose of addressing U.S. charges that Russia had conducted several tests of the INF Treaty prohibited system. We also call upon the administration to seek new ways to provide further details about the nature of the Russian violation, particularly to U.S. allies threatened by the missiles. The inability to share more information has made it easier for Russia to deny a violation exists and harder for U.S. allies and other countries to put additional pressure on Russia. Retaliating to Russia's violation by withdrawing from the INF Treaty, or stopping U.S. implementation of the successful 2010 New Strategic Arms Reduction Treaty (New START), would be counterproductive and self-defeating. A wide-range of U.S. national security leaders, as well as U.S. military officials, continue to assess that New START remains squarely in the U.S. national interest and that terminating or withdrawing from the agreement would undermine U.S. security. Without continued U.S. support for existing nuclear arms control agreements and other types of cooperative nonproliferation engagement, Russian forces would be unconstrained. Not only would the United States have little leverage or basis to constrain Russian forces other than military and economic measures, it would not have verification measures in place to assess what Russia is doing. The United States should pursue firm but measured steps to reaffirm its commitment to the defense of those allies that would be the potential targets of these new INF Treaty noncompliant missiles. (Washington, DC)—According to an exclusive Reuters story published this afternoon, President Donald Trump denounced the landmark 2010 New START agreement in his first telephone call with Russian President Vladimir Putin. Reuters also reported that when Putin raised the option of extending New START, Mr. Trump had to ask his aides what the treaty was. The 2010 New START agreement has advanced U.S. and global interests by lowering and capping the two nation’s excessive strategic deployed nuclear arsenals, both of which remained poised on launch-under-attack alert status, meaning that thousands of nuclear weapons could be launched by the U.S. and Russian leaders within minutes of the go order. The most important responsibility of any American president is to reduce nuclear dangers and to avoid nuclear catastrophe. Unfortunately, Mr. Trump appears to be clueless about the value of this key nuclear risk reduction treaty and the unique dangers of nuclear weapons. A wide-range of U.S. national security leaders, as well as U.S. military officials, continue to assess that New START remains squarely in the U.S. national interest and that terminating or withdrawing from the agreement would undermine U.S. security. Ending New START would irresponsibly free Russia of any limits on its strategic nuclear arsenal and terminate the inspections that provide us with significant additional transparency about Russian strategic nuclear forces. It has been longstanding U.S. policy to seek to further reduce the role and number of nuclear weapons in U.S. policy. The five most recent U.S. presidents, including Barack Obama, George W. Bush, Bill Clinton, George H.W. Bush, and Ronald Reagan, negotiated agreements with Russia to reduce their nuclear stockpiles. During his confirmation hearing last month, Secretary of State Rex Tillerson expressed his support for New START and continued engagement with Russia and other nuclear-armed countries on seeking further verifiable reductions of nuclear weapons stockpiles. Trump and his team must get smart about New START and the unique dangers of nuclear weapons. Before the end of his term in office, Trump will need to decide whether to invite Russia to extend New START for another five years and/or negotiate a new arms reduction treaty. 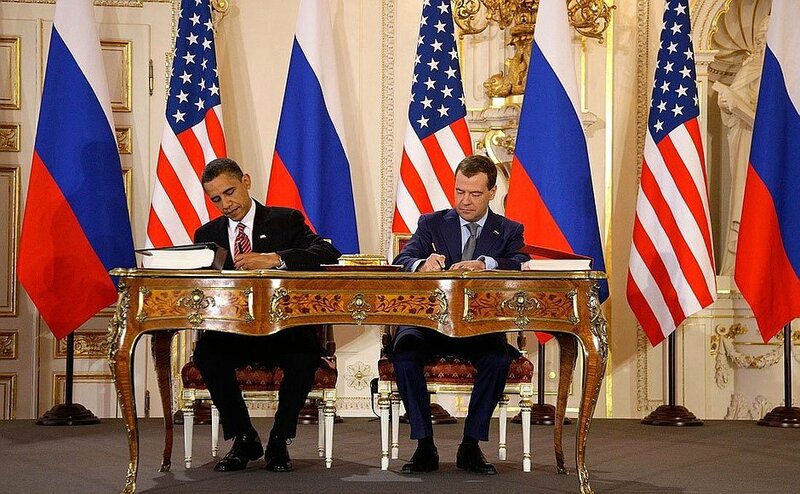 The United States and Russia should work together to build down, not build up. 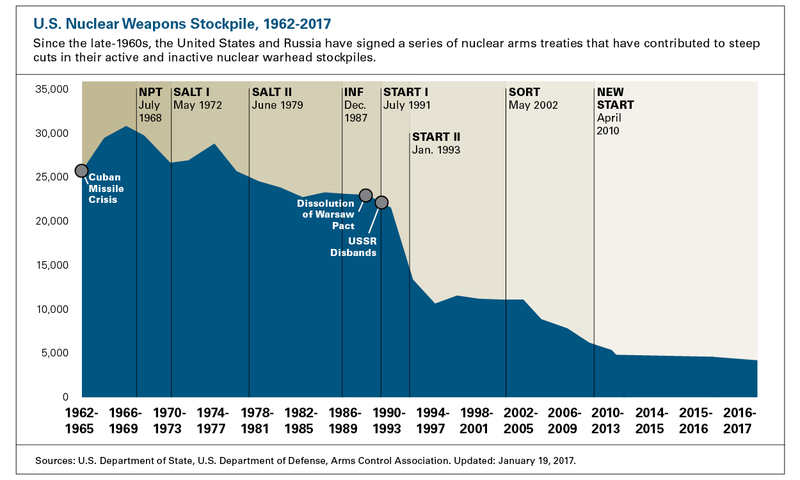 With up to 1,550 deployed strategic nuclear weapons allowed under the 2010 New START agreement and no limits on the tactical nuclear weapons possessed by each side, Russia and the United States have far more weapons than is necessary to deter nuclear attack by the other or by another nuclear-armed country. Further nuclear reductions would also save both countries tens of billions of dollars in their ongoing programs to replace their current arsenals and would strengthen global nonproliferation and nuclear risk reduction efforts. The Arms Control Association applauds Sen. Ed Markey (D-MA) and Rep. Ted Lieu (D-CA) for reintroducing legislation to highlight the unconstrained and undemocratic ability of the president to initiate the first-use of U.S. nuclear weapons. The Restricting First Use of Nuclear Weapons Act of 2017 would prohibit the president from launching a nuclear first strike without a declaration of war by Congress. Put simply, the fate of tens of millions depends in large part on the good judgment and stability of a single person. At any moment, there are roughly 800 U.S. nuclear warheads–all of which are far more powerful than the weapons that destroyed Hiroshima and Nagasaki in 1945–that can be launched within minutes of an order by the president. The president, and the president alone, has the supreme authority to order the use of nuclear weapons. Congress currently has no say in the matter. Continuing to vest such destructive power in the hands of one person is undemocratic, irresponsible, and increasingly untenable. In an August 2016 HuffPost/YouGov survey, two-thirds of respondents said the United States should use nuclear weapons only in response to a nuclear attack or not at all, while just 18 percent think that first-use is sometimes justified. Indeed, it is all but impossible to imagine a scenario where the benefits of the first-use of U.S. nuclear weapons would outweigh the severe costs. The inauguration of President Donald Trump has heightened fears about the sole authority of the commander in chief to use nuclear weapons. Both Republicans and Democrats have expressed deep concern about his erratic behavior and loose talk on nuclear weapons. Now is the time to put responsible checks on the use of nuclear weapons in place. Such a decision is far too important to be left in the hands of one person. Requiring that a decision to use nuclear weapons be made by more than one person. This could include the president, vice president, secretaries of state and defense, and perhaps one or more designated members of Congress, such as the speaker of the House. Eliminating the requirement to launch intercontinental ballistic missiles (ICBMs) under attack, which in some scenarios would give the president only minutes to decide whether to launch the missiles before some or all of them are destroyed on the ground. Given that a president would almost certainly not make the most consequential decision a president has ever made in a matter of minutes, retaining a launch under attack posture is unnecessarily risky and eliminating it would increase the time available to consider the possible use of nuclear weapons in retaliation to a nuclear attack against the United States or its allies. Provide Congress with more information on U.S. nuclear war plans, including targeting data, attack options, damage expectancy requirements, estimated civilian casualties, and more, which is currently not shared with Members of Congress.